TMS neck pain is one of the most prevalent types of tension myoneural syndromes which can be experienced anywhere in the human anatomy. TMS is the name of the condition which was first diagnosed by Dr. John E. Sarno of the Rusk Institute of Rehabilitation Medicine at Manhattan’s NYU Medical Center. Dr. Sarno has been researching, investigating and treating TMS pain for decades now and has been joined by many younger doctors who have taken up his cause of proving the considerable and universal link between the subconscious mind and chronic physical pain conditions in the body. Dr. Sarno (RIP) is noted for treating celebrities and sports figures successfully during his long and world renowned career in traditional rehabilitative medicine. He is also the physician who treated me many years back and helped me to beat horrific lower back pain which had previously been misdiagnosed as stemming from a combination of disc, spinal curvature and muscle imbalance issues in my lumbar and lumbosacral regions. This dialog details the diagnosis and treatment of tension myoneural syndrome, with a special focus on symptoms based in the neck region. TMS is a mindbody disorder in which the body suffers pain and nerve symptoms not due to any disease process, degeneration or injury, but instead wholly as a result of the subconscious mind using a defense mechanism to enact regional ischemia. Ischemia means a reduction in blood supply and therefore, oxygenation of the involved tissues. Since all cells require oxygen to live, and even low levels of reduced oxygenation will cause consequences, this process is painful and often functionally affective. The extent of the symptoms usually varies and relates to the severity of the underlying psychoemotional issues which are deemed causative. Many patients with minor repressed and suppressed emotions, such as anger or fear, will suffer recurrent headaches or stomach concerns. More serious emotional issues might require a chronic pain condition, such as ischemic neck pain. Meanwhile, extreme emotional repression or suppression can result in crippling conditions like fibromyalgia. Tension myositis syndrome is a chronic condition in which patients suffer muscular pain, nerve pain and other types of discomfort, often in combination with neurological symptoms, such as tingling, numbness, burning or weakness in various areas of the body. The most common location is the lower back, while the neck ranks as number two. Patients may only have pain is a certain area, and those regions may be regular and predictable, or symptoms may change and move about often. Patients may also have widespread and structurally-illogical pain, such as in the case of fibromyalgia, which may once again, be patterned or unpredictable in its severity, locations and duration. The majority of patients affected by TMS in the neck suffer direct and burning neck pain, often radiating into one or both arms, hands or fingers. 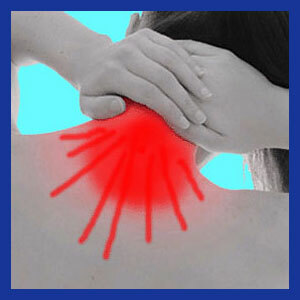 Shoulder pain is also almost a given, with many sufferers reporting pains under one shoulder or between the shoulders. The majority of patients also suffer regular headaches, also at the base of the neck and on the same side as the neck pain takes place. Structures typically involved include the cervical spine, the neck muscles and the circulatory system, since the smallest of arteries are the actual structures implicated in narrowing and sourcing the symptoms to begin with. TMS is a complicated topic which is far beyond the scope of a single article like this one. 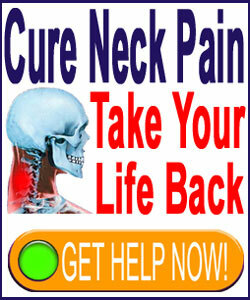 We write extensively on the topic on the original Cure-Back-Pain.Org site and in our books. If you are interested in learning more about tension myositis syndrome, we recommend you go straight to the source and read all of Dr. Sarno’s books. These can be found in your local library for free, so the research is truly no risk. These books will change your perception of chronic pain and might even put you on the right path towards a real cure for your neck pain. Dr. Sarno calls his treatment knowledge therapy and it may be a consideration for patients whose pain has not responded to more traditional care methods. There are no risks whatsoever. It is truly the only neck pain treatment of its kind. This approach to relief is also used by many successful chronic pain coaches. No money to waste. No health side effects. No risks at all. Who else can claim this? Good for you, Dr. Sarno. Our Cure Back Pain Forever Program is the perfect complement to Dr. Sarno’s TMS therapy program. However, it goes far beyond Sarno’s work, offering a more comprehensive plan of action encompassing practices to prevent, manage and cure pain.